This is 2 Magazines in one. Part 1: Thinking about brewing your first batch of beer? Whether you're planning on going extract, partial-mash or the all-grain route; this is your one-stop guide & brewing reference tool to get your brewing off on the right foot. The BYO Beginner's Guide steers you through all the basic steps of making wort in an easy to understand format. Don't let the title fool you either. Even if you're a brewer with several batches under your belt, you're sure to glean some very valuable information in the Beginner's Guide. Part 2: Thinking about concocting your first batch of wine? Learn how to make wine, whether you're planning on using a kit, juice or fresh fruit. This is your one-stop guide & reference tool to get your winemaking off on the right foot. The WineMaker Beginner's Guide steers you through all the basic steps of selecting equipment, building recipes and knowing your ingredients in an easy to understand format. Don't let the title fool you either. Even if you have several batches under your belt, you're sure to glean some very valuable information in the Beginner's Guide. We've collected and updated the best hops information from the past 12 years of BYO and included updated charts with the specifications for 102 hop varieties and suggested substitutions for hard-to-find hops. We've also detailed hopping methods, hop growing info, hop-related build-it projects, and 36 hoppy recipes. Since 1978, Zymurgy magazine has been the leading light for amateur brewers in North America and around the world. It features innovative and award-winning recipes, articles on do-it-yourself equipment building, explanations of brewing science, and presentations of brewing techniques in addition to a healthy dose of beer culture. 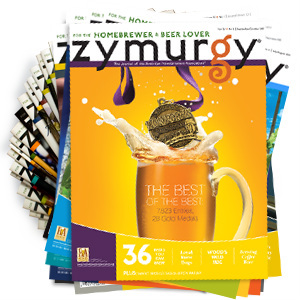 Zymurgy represents the best of homebrewing with articles that appeal to every level of interest in the homebrewing hobby. Published six times each year, Zymurgy includes an annual “Winners Circle” special issue (September/October) that includes recipes for all of the AHA National Homebrew Competition gold medal winners.